Looking for Mackay accommodation? Do you want somewhere quiet and relaxing to stay near the beach yet away from crowds? Wonderful — because you’ve found the right place! The Shores Holiday Apartments is the perfect holiday destination for families and couples. Located on the beach at Blacks Beach in Mackay’s Northern Beaches. It’s only 12 minutes away from Mackay’s City Centre. Featuring two-storey Townhouses & ground level Villa Accommodation. All units are spacious and self-contained. There is plenty of room to spread out and relax. The kitchen has all the modern conveniences including a large fridge and dishwasher. Each unit has a washing machine and clothes dryer. The open plan lounge/dining areas have a big screen digital TV with Foxtel, DVD player, and free WiFi. There is a second TV with Foxtel in the queen size bedroom. Each unit has a furnished undercover patio area and single carport. Cots are available at $20 for the duration of your stay. Furnished with a queen size bed, these units sleep two guests. Prices are for one or two guests using existing bedding. These units sleep four people with a queen bed in the main bedroom and two singles in the other. The price is for 4 guests using existing bedding. Most two bedroom units have a double sofa bed in the lounge that can sleep an extra two guests. There is a charge per night for each extra person above four. The total number of persons allowed in a unit is six. Feel like some laid back quiet time? Browse our extensive range of books, board games, puzzles and DVD’s at reception. We also provide tennis racquets, tennis balls or a volleyball for outdoor activities. There is no charge to use these items. – Stroll through the verdant tropical gardens abundant with native birds. – Cool off at the double swimming pool enclosure with toddlers pool and cold water spa. – Rest at a table under a beach umbrellas or relax in a recliner lounge in the shade. – Relive memories by watching children having fun playing hopscotch. 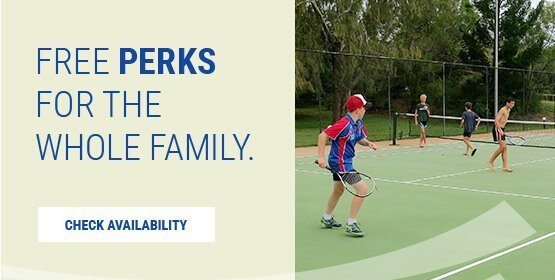 – Play a game of tennis on our full sized tennis court day or night or play volleyball near the beach. – Cruise by the expansive lawn area nearby and marvel at the towering beach almond and Indian bean trees. – Shade-covered electric BBQ & picnic area with seating for 30 people. -Wood fire BBQ pit — a great place to sit at night toasting marshmallows with the kids.